Two going on twenty. : Life. Is. Good. 1st- I got to see Amie today which always makes for a good day. 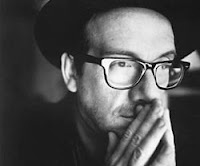 2nd- I was on the bus with my girl and she turned to me out of the blue and said, "Mom, out of the two Elvis', I think Costello is way better than the other guy." I had to text several people right away. I told her I could not be more proud and that my job is done. There is nothing more to teach her. To which she replied, "Mom, you are so weird." 3rd- On a whim, in the mall, I decided to try on jeans. This is something I normally hate with a burning passion so I just don't do it. Not only did I buy jeans that were two sizes smaller than the last time I went shopping, but they look great! I almost fainted. I was so excited that I changed into them right then and wore them for the rest of the day! Hooray for making healthy lifestyle changes and having them finally pay off! 4th- Darian and I are still on our personal mission to see every romantic comedy that comes out in 2007. We are hoping to see one every weekend. The last few have been sorta hrmph, but today's was a very pleasant surprise. We saw "Because I said so." (I can almost hear a few of you groaning. Don't worry, Jon already groaned at me for it, but she is 12 people, come on! It is better than some of the cartoons I've had to sit through!) It actually had some pretty charming and funny moments. It is worth a rent when you are feeling girly. 5th- I found a really interesting looking book at the book store, I'm going to read it tonight. 6th- There will be an acoustic Posies show in Seattle on May 11th. Details to come. I finally got permission to mention it! congrats - a healthy lifestyle is hard work and definitely something to be really proud of. You should! That would be great! And yes, healthy = goodness!